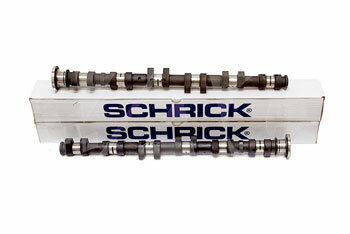 We have used these Schrick cams for many years and our customers continue to have consistent, powerful and reliable results. This cam set for BMWs inline 6 is one of the best overall performance upgrades you can install. Not a peaky, or hard to live with pair, this matched camshaft set increases performance throughout the available rev range and has always been a best seller- especially for the street performance or dual street/track uses cars as its a smooth power gain with very little compromise in idle quality. These are a direct replacement for stock 264 In / 256 Ex matched set Manufactured in Europe from premium blanks. On the street your BMW will be faster and more powerful in all areas. Idle is streetable and power band is linear. Improved torque along with horsepower will improve 0-60 as well as highway performance. Gas mileage will not suffer terribly. You will feel "BMW should have made it this way from the factory". If you are still running the stock M3 or 328 pistons, this is an excellent match for your engine. On the track, these cams are excellent for the beginner or the seasoned racer. Flat power band means a fast, easy to control car around the track with less stress and strain on the engine. These camshafts can truly be run without internal engine work, although uprated valve springs are absolutely a recommended safety measure for tracked cars as the OE springs will NOT tolerate any over-revs. VAC Tech Tip: We recommend that nearly all Camshaft upgrades should be accompanied by upgraded valve springs for performance and engine reliability: If the engine is ever over revved, or you accidentally miss shift, the engine could be damaged. Uprated springs can help protect against this costly and severe accident. M50 2.0 and 2.5 engines will need aftermarket pistons with enlarged valve reliefs.